Most patterns employ straight lines (such as triangles), although a few use semicircles or semiellipses (such as head-and-shoulders). Pattern lines generally follow either the highs or the lows. You usually want to organize pattern types according to whether they forecast a continuation or a reversal of the current price move, although you can apply many patterns (such as triangles) either way. Pattern identification can be frustrating and time consuming. 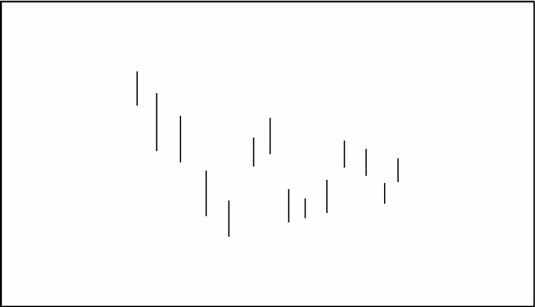 Resign yourself to making a lot of mistakes, and then, even valid patterns fail some of the time, like all indicators. The reason to tolerate the pattern recognition process is that when you get it right, you have a powerful forecasting tool that can deliver high returns. Not everyone can see patterns right away. Pattern identification takes practice — and a lot of drawing and redrawing of lines and shapes until you get the hang of it. For example, consider this figure. Do you see the pattern? The pattern is a symmetrical triangle, as you can see in this figure. The triangle is characterized by a series of lower highs along which you can draw one trendline, and a series of higher lows along which you can draw another trendline. The two lines eventually come together at an apex. Before that point is reached, the price must pierce one of the trendlines simply in the course of trading in its normal range. You usually see a burst of higher volume when a pattern reaches completion. This observation makes sense — other chartists in the crowd are seeing the same pattern. 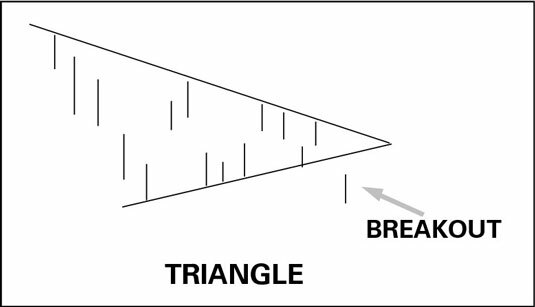 For triangles, low volume often precedes the breakout, and serves as a bonus warning of an impending move. Pattern identification doesn’t require that each single price in a series line up perfectly. Not every price high hits an overhead resistance line, for example. It suffices that several hit the line. All triangles — symmetrical, ascending, and descending — incorporate support (top) and resistance (bottom) lines, as do flags and pennants, and other patterns. Opinion differs on whether the top and bottom lines must enclose every part of every price bar, or if it’s okay for the bar to break the line by a tiny amount as a triangle pattern is developing.